Your garage is one of the most important parts of your home. Whether you use it for storage, car parking, or for your DIY woodworking projects, the garage should always be safe, secure, and convenient. It should always be in top shape to keep burglars as well as the elements away. 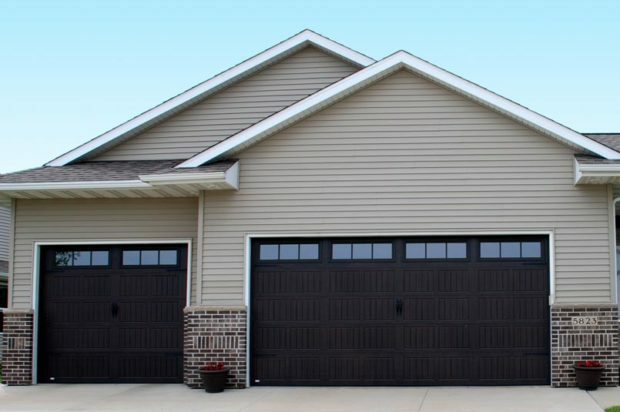 But all too often, most people fail to pay enough attention to their garage doors, which is the first line of defense when it comes to garage safety and security. While some garage door issues and faults may require the intervention of an expert technician, there are some repairs that you can do by yourself. Additionally, proper maintenance is always key to preventing such problems in the first place. Well, without going in circles any further, here are 4 tips for repairing your garage door. Especially when there’s an abrupt power outage when your garage door is closed, it may fail to open. Before freaking out and calling your technician, there’s one thing you can try to repair your door. Simply check the door’s guide track and locate a hanging cord with a red handle. The garage door opener relies on this cord to open. Simply pull this cord to perform a manual override to get yourself into or out of your garage. Freezing is another common problem that garage owners have to deal with during the cold season. When it freezes, your garage door may become stiff and lose the power to open. Simply adjusting the pressure settings can get your garage door operating smoothly again. With time, older garage doors tend to sag, especially the wooden ones. This can affect the smooth running of the garage door, possibly ruining the opener’s smooth functioning. You can straighten up a sagging door by squaring it up using the tension rods at the back of the door. Another common problem with garage doors occurs at the locks, which are mostly located along the center of the door. When the locks shift in position, the smooth operation of the door, especially the locking mechanism, is affected. You can solve this problem on your own, nevertheless. First, unscrew the guide brackets at the door’s edges so as to reposition them such that they direct the locking bars into their designated locking slots. When done, lubricate your locks using machine oil and you are good to go. Needless to mention, you can’t be able to fix all garage door issues without professional expertise. Call a professional garage door repair if you notice either of the following issues or signs. In summary, a non-working opener, a noisy operation, cracks, sagging, and faulty locking mechanism are some of the most common garage door problems. While some of these can be fixed DIY, others may need the attention of a professional repairer. The trick is to be sure to hire the best in the trade. If you come from this coastal area of California, for instance, you’ll want to get the best garage door repair San Diego has to offer. Nonetheless, maintenance tasks such as regular lubrication, roller checks, and balance checks will go a long way in saving you from the inconvenience and keeping your repair costs down.